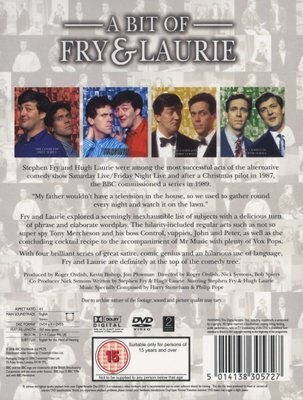 Stephen Fry and Hugh Laurie were among the most successful acts of the alternative comedy show Saturday Live/Friday Night Live and after a Christmas pilot in 1987, the BBC commissioned a series in 1989. Fry and Laurie explored a seemingly inexhaustible list of subjects with a delicious turn of phrase and elaborate wordplay. The hilarity-included regular acts such as not so super spy Tony Mercheson and his boss Control, yuppies, John and Peter, as well as the concluding cocktail recipe to the accompaniment of Mr Music with plenty of Vox Pops. With four brilliant seasons of great satire, comic genius and an hilarious use of language, Fry and Laurie are definitely at the top of the comedy tree. I watched the whole series and threw it in the bin. 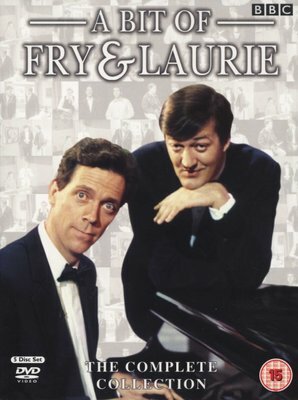 Hugh Laurie is very talented but Stephen Fry is disgusting!